Today i wan't to talk about Skills in Martyr and how, in my view, to improve this system. Splitting skills into different tree is a good idea. 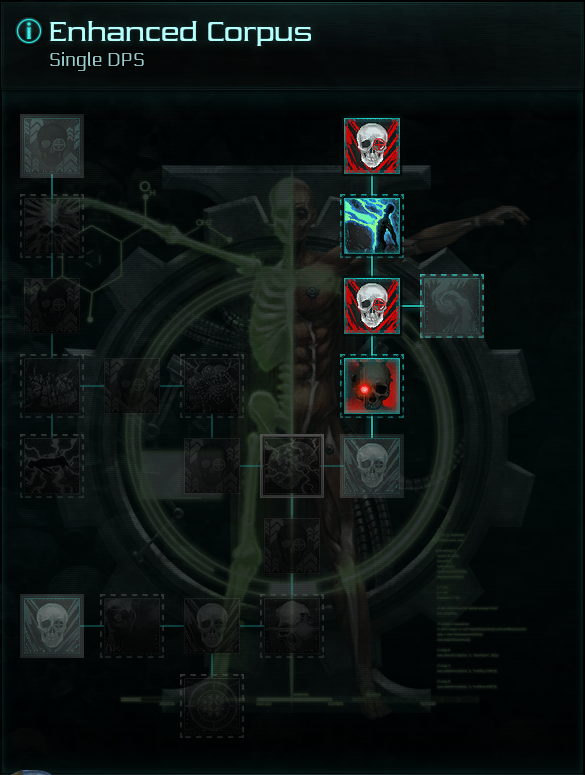 It's less shiny at first glance, but it's easier to understand for new player, can be as complex and deep for old player, and it gives the dev team less things to worry about when updating than a fully connected tree. Some portion of the trees are very well done and make the grind feels good. For exemple the following tree, Single Target. The top right part is very good. You have minor stat skills in between more important and situationnal skills. Those bigger skills are defining that part of the tree which is about supression and help each others. The only big skill that branch out is purely optionnal compare to the two others that are more core. Every two level you have a "power spike". Feels cohesive, feels rewarding, with the extra choice on top ! Regarding what i just said before, they are multiple kind of skills, all important ! Minor that will not completly change your gameplay, core that together move the way you play towards one direction, and optionnals that can complement core skills or completly change the way you are gonna play or build. All are important in their way. I said i like every kind of skills ... i lied ! I hate minor skills in this type of implementation, especially in some trees where 4 minor are only splitted by a core one that does exactly the same thing. Am i choosing my build and playstyle or just grinding it ? Trees with 1 or 2 branches only. Same question. The fact you have to unlock every branches of a tree to unlock the "ultimate" skill. Same question. Most trees are extremely focused and limit your gameplay instead of expanding it. For example, there is only one good traits in Area of Effects that can help me when playing mostly single target, and it requires a total of 7 points to unlock it. I can't improvem every single ability from my weapon set, and that's a feels bad man. Overall many skills are promoting random procs or simple stat increase instead of predictible (but with pronounced trade of) procs. Ok my character will feel stronger, but not different, and will not ask me to change or adapt the way i play. And in my opinion, any grind system must change the way i play over time, or i will very quickly get bored. Make it so i can unlock the "ultimate" skill from a tree without having to unlock the entire tree. That way choosing one or more branch is about choice, not necessity. Make sure every branch has a theme attached to it. For exemple the Single Target tree i spoked about earlier. The theme was single target suppression. Every branch should feel cohesive, with one or more optional skills available. Talking about theme, introduce support / with trade of branches. I wan't my Area of Effect to expand in order to support my single target damage. Or my single target damage to amplify my Area of Damage on key units i already "marked". Or i wan't my critical damage to amplify or unlesh all the DoTs i'm stacking on my ennemies, etc etc. The goal on those branches is purely to make a build feel complete, with every abilities being amplified in one way or another. On "core" and "optionnals" skills, less stats boost or random procs, or give me the choice between random and condition based. Instead of having 2% change of executing, the next critical hit on a knocked back ennemy with less than 30% hp will execute him (pure example). I can control this proc, i can make it so my gameplay will evolve around it. Instead of having only 5% crit bonus for the first attack on an ennemy, give me the choice with a perk with 100% crit chance on the first attack, and every 4 attack after it for example, but i can't random crit anymore. Once again a ton of idea can be used here, especially with a bit more complex branches. Rebuild minor with a new system. A minor skill doesn't have a native stat attached to it, however i can choose between multiple predefined stats attached to the tree. For example, with Physical Damage : Damage, SupressionDamage, Crit Chance, Crit Damage. Then, add a new layer of complexity, making that if i choose 3 times the same stat, i get a more important stat bonus or a special effect. 3. Let's talk crazy things ! Last suggestion, a bit crazy, allow us to unlock activable abilities with skills. 1 to 4 slots, cooldown or ressource / performance based ? I have invested all my point in defense, i go in, i take a lot of damage for my group, i can use an ability that will support me and my team to survive a really hard engagement. I hope it was a good read ! Gl hf guys ! You seem to have given this allot of thought, and its straight to the point. Would it be too much too ask of you to either link this post in my post, https://neocoregames.com/en/community/hub/help-us-help-you-neocore, or simply copy/paste the whole thing into formentioned post? I think your ideas deserve more attention and my only mission in this is to get as many thought-out ideas/suggestions etc. in one place so we can hopefully come up with very concrete examples to NeoCore about what we want, and how we want it. Of course, all credit in your post goes to you, I am just trying to gather the clever minds.